Tracheomalacia is an abnormal collapse of the tracheal walls. It may occur in an isolated lesion or can be found in combination with other lesions that cause compression or damage of the airway. Tracheomalacia is usually benign, with symptoms due to airway obstruction. As such, this condition is often mistaken for chronic asthma or prolonged bronchiolitis. This shows the trachea during inspiration and expiration. Tracheal collapse of more than 50% during expiration is diagnostic of tracheomalacia. Tracheomalacia may occur as a primary lesion, in which case the cartilage of the trachea develops abnormally. This results in tracheal walls that are soft and collapse during respiration. The collapse causes airflow obstruction and wheezing, stridor, or both. If the lesion is extrathoracic, the collapse and airway sounds occur primarily during inspiration. If the lesion is intrathoracic, the collapse and airway sounds occur primarily during exhalation. Because most of the trachea is intrathoracic, exhalatory collapse accounts for most cases of tracheomalacia. Tracheomalacia may also be found in conjunction with lesions that compress the airway, such as mediastinal masses, vascular slings, and vascular rings. It also occurs with increased frequency in children with chronic inflammation of the proximal airways. Less common in asthma, this etiology of tracheomalacia is more often seen in children with chronic lung disease of infancy, gastroesophageal reflux, or other forms of chronic aspiration. Primary tracheomalacia is sometimes referred to as type 1, tracheomalacia associated with extrinsic compression is sometimes referred to as type 2, and tracheomalacia associated with intra-airway irritation/inflammation is sometimes referred to as type 3. Tracheomalacia is frequently found after repair of a tracheoesophageal fistula and may cause significant symptoms for several years after the repair. The frequency of tracheomalacia is unclear. The condition appears to primarily derive from a developmental defect in the cartilage of the tracheal wall. Therefore, the lesion usually occurs in infants and young children. It is frequently found in children who have undergone repair of a tracheoesophageal fistula, chronic lung disease of infancy, vascular compression of the airway, or mediastinal masses of sufficient firmness to compress the airway. Children with gastroesophageal reflux, or aspiration from above, have an increased incidence of tracheomalacia. The problem in this last situation is trying to decide which condition is the cause and which is the effect. Morbidity and mortality are extremely rare. On occasion, tracheomalacia causes enough obstruction to necessitate intervention. This obstruction generally takes the form of episodic severe airway obstruction causing cyanosis. When infants with chronic lung disease of infancy become irritated, they may have what has been called a "BPD fit." This episode usually involves a cry, with either a breath hold or with a sufficient increase in intrathoracic pressure to partially occlude the airway. If the child has tracheomalacia, the frequency and severity of these episodes is often increased. No racial predilections are known. No gender predilections are known. Because most cases of tracheomalacia appear to be related to a developmental defect in the cartilage of the tracheal wall, the lesion typically occurs in infants and young children. In most children, the tracheal cartilage normalizes, the airway enlarges, and symptoms resolve by 3 years of age (in many before age 1 y). Because tracheoesophageal fistula is usually repaired early in life, the associated tracheomalacia also appears in early infancy, usually shortly after surgery. If the tracheomalacia is a result of compression, the patient's age at presentation depends on the cause of compression. Vascular rings, present from birth, cause tracheomalacia early in life. Other causes of compression, especially tumors, occur later in life. Boogaard R, Huijsmans SH, Pijnenburg MW, et al. Tracheomalacia and bronchomalacia in children: incidence and patient characteristics. Chest. 2005 Nov. 128(5):3391-7. [Medline]. Okata Y, Hasegawa T, Bitoh Y, Maeda K. Bronchoscopic assessments and clinical outcomes in pediatric patients with tracheomalacia and bronchomalacia. Pediatr Surg Int. 2018 Jan. 34 (1):55-61. [Medline]. Jamal N, Bent JP, Vicencio AG. A neurologic etiology for tracheomalacia?. Int J Pediatr Otorhinolaryngol. 2009 Jun. 73(6):885-7. [Medline]. Boiselle PM, Ernst A. Tracheal morphology in patients with tracheomalacia: prevalence of inspiratory lunate and expiratory "frown" shapes. J Thorac Imaging. 2006 Aug. 21(3):190-6. [Medline]. Snijders D, Barbato A. An Update on Diagnosis of Tracheomalacia in Children. Eur J Pediatr Surg. 2015 Aug. 25 (4):333-5. [Medline]. Vinograd I, Filler RM, Bahoric A. Long-term functional results of prosthetic airway splinting in tracheomalacia and bronchomalacia. J Pediatr Surg. 1987 Jan. 22(1):38-41. [Medline]. Yalcin E, Dogru D, Ozcelik U, et al. Tracheomalacia and bronchomalacia in 34 children: clinical and radiologic profiles and associations with other diseases. Clin Pediatr (Phila). 2005 Nov-Dec. 44(9):777-81. [Medline]. Vinograd I, Keidar S, Weinberg M, Silbiger A. 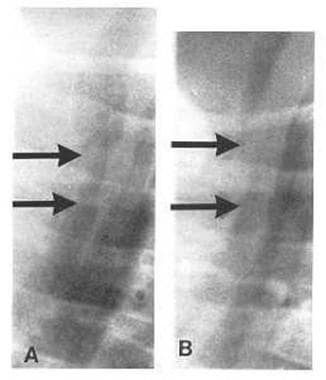 Treatment of airway obstruction by metallic stents in infants and children. J Thorac Cardiovasc Surg. 2005 Jul. 130(1):146-50. [Medline]. Valerie EP, Durrant AC, Forte V, et al. A decade of using intraluminal tracheal/bronchial stents in the management of tracheomalacia and/or bronchomalacia: is it better than aortopexy?. J Pediatr Surg. 2005 Jun. 40(6):904-7; discussion 907. [Medline]. Austin J, Ali T. Tracheomalacia and bronchomalacia in children: pathophysiology, assessment, treatment and anaesthesia management. Paediatr Anaesth. 2003 Jan. 13(1):3-11. [Medline]. Casiano RR, Numa WA, Nurko YJ. Efficacy of transoral intraluminal Wallstents for tracheal stenosis or tracheomalacia. Laryngoscope. 2000 Oct. 110(10 Pt 1):1607-12. [Medline]. Dave S, Currie BG. The role of aortopexy in severe tracheomalacia. J Pediatr Surg. 2006 Mar. 41(3):533-7. [Medline]. [Guideline] Fayon M, Donato, L. Tracheomalacia (TM) or bronchomalacia (BM) in children: conservative or invasive therapy. (French). Archives de Pediatrie. January 2010. 17:97-104. Furman RH, Backer CL, Dunham ME, et al. The use of balloon-expandable metallic stents in the treatment of pediatric tracheomalacia and bronchomalacia. Arch Otolaryngol Head Neck Surg. 1999 Feb. 125(2):203-7. [Medline]. Inoue K, Yanagihara J, Ono S, et al. Utility of helical CT for diagnosis and operative planning in tracheomalacia after repair of esophageal atresia. Eur J Pediatr Surg. 1998 Dec. 8(6):355-7. [Medline]. Masters IB, Chang AB. Interventions for primary (intrinsic) tracheomalacia in children. Cochrane Database Syst Rev. 2005. CD005304. [Medline]. Panitch HB, Keklikian EN, Motley RA, et al. Effect of altering smooth muscle tone on maximal expiratory flows in patients with tracheomalacia. Pediatr Pulmonol. 1990. 9(3):170-6. [Medline]. Sirithangkul S, Ranganathan S, Robinson PJ, Robertson CF. Positive expiratory pressure to enhance cough effectiveness in tracheomalacia. Journal of the Medical Association of Thailand. November 2010. 93 Suppl 6:S112-8. van der Zee DC, Straver M. Thoracoscopic aortopexy for tracheomalacia. World J Surg. 2015 Jan. 39 (1):158-64. [Medline]. Montgomery J, Sau C, Clement W, Danton M, Davis C, Haddock G, et al. Treatment of tracheomalacia with aortopexy in children in Glasgow. Eur J Pediatr Surg. 2014 Oct. 24 (5):389-93. [Medline]. Arnaud AP, Rex D, Elliott MJ, Curry J, Kiely E, Pierro A, et al. Early experience of thoracoscopic aortopexy for severe tracheomalacia in infants after esophageal atresia and tracheo-esophageal fistula repair. J Laparoendosc Adv Surg Tech A. 2014 Jul. 24 (7):508-12. [Medline]. Jennings RW, Hamilton TE, Smithers CJ, Ngerncham M, Feins N, Foker JE. Surgical approaches to aortopexy for severe tracheomalacia. J Pediatr Surg. 2014 Jan. 49 (1):66-70; discussion 70-1. [Medline]. Slide tracheoplasty and left PA sling repair. Procedure performed by Giles Peek MD, FRCS, CTh, FFICM, The Children’s Hospital at Montefiore, Bronx, NY.